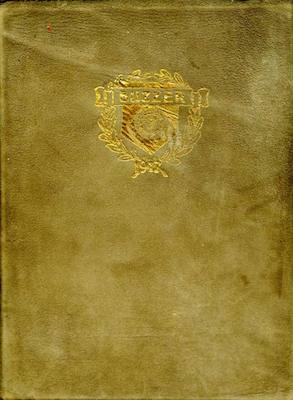 A yearbook from the Utah Agricultural College (which became Utah State University in 1957) that was owned by Ernest Freeman. He was a sophmore in college that year and is pictured among the class photographs and as a member of the Aggriculture Club. The freshman and sophmore classes only get their names and their picture, while junior and senior students. The yearbook also has sections on the various clubs that the college has. There is a 'Year in Review' where they list specific activities by date with sometimes humorous additions to them. In the front is a dedication to Dr. George Thomas who had just left the school to join the Federal Reserve Bank.